Red clover (Trifolium pratense), is a perennial herbaceous flowering plant in the family Fabaceae. It grows satisfactorily in the cool climates and well drained soils. It is native to Europe, Western Asia and Northwest Africa but now have been naturalized and introduced in various parts of the world. Medium (double cut) and Mammoth (single cut) are the two varieties of Red clover. Other common names for this species are: Beebread, Meadow Clover, Meadow Trefoil, Purple Clover and Sweet Kitty Clover. It could be found in dry or wet grasslands, meadows, field borders, forest margins, paths, pastures and roadsides. The flowers of Red clover are pollinated by the bumblebees than honey bees. Medicinally, it is used to treat the health ailments such as whooping cough, cancer, skin inflammation and respiratory problems. Red clover is believed to possess diuretic and expectorant properties. Red clover helps to reduce cholesterol, balance estrogen, enhance circulation, urination, promotes immunity, bone health, lowers hypertension and supports cardiovascular health. Aficionados of alternative medicine say that this flowers are real natural hormone therapy, and that relieves and heals many health conditions. Red clover is used for decades as a cure for symptoms that come with menopause. It is natural hormonal therapy, say the experts of the alternative medicine. Except in menopause red clover blossoms are useful in many other medical conditions such as asthma, bronchitis and inflammatory processes in the body. Experts say that the flower of red clover is good for improving blood circulation, lowering cholesterol and maintaining the health of the heart and blood vessels. 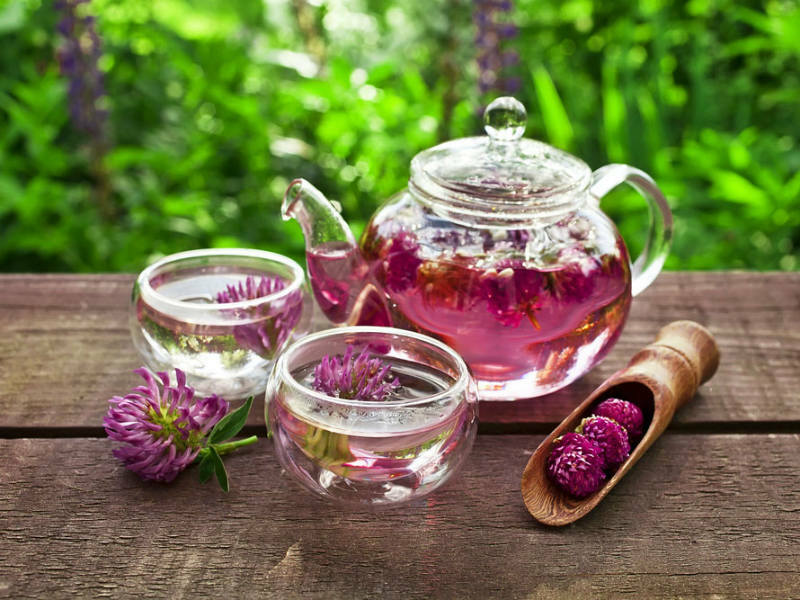 Various creams to soothe the inflammation of the skin, teas for sore throat and syrups to treat asthma, bronchitis and reduce the symptoms that come with menopause are prepared from red clover blossoms in folk medicine. Promotes Heart Health – Red Clover is beneficial for heart health as the isoflavones present in clover is an effective ingredient to increase HDL or good cholesterol both in pre- and post-menopausal women. A lot of researches suggest that red clover is chemoprotective, which means that it protects the body tissues from the harmful actions of anti-cancer medications. It also contains a blood-thinning compound called coumarin, which helps to maintain flexible and compliant arteries. In turn it prevents blood-clotting and ensures healthy blood circulation. Having said so, people who are already on anti-coagulants (or blood-thinners), persons suffering from breast cancer, pregnant or breast-feeding women and infants should avoid consuming the herb. Helps with PMS – Red clover possesses isoflavones which helps to maintain the level of estrogen and balance the hormonal shifts and also prevents the mood swings. It also helps to reduce the breast pain. It is helpful for the women with PMS and menopause which can cause the unpredictable and harmful change in the hormone level. One study shows that the Red clover extract reduced the hot flashes in the menopausal women. Powerful Immune Booster – If you consume the greens of red clover, you are much more likely to get a high dose of vitamin C than if you consume the tea. Vitamin C is a powerful immune system booster, and can help to stimulate the production of white blood cells. Furthermore, if you consume the leaves in the form of tea, then you can get a healthy dose of antioxidants. Antioxidants can neutralize free radicals, which cause degenerative diseases and cell mutation. The overall immune boost of red clover includes preventing infections, both viral and bacterial. Prevents Osteoporosis – Pre or post-menopausal women are at maximum risk of low bone density due to sinking estrogen levels, which may lead to osteoporosis. The isoflavones present in red clover mimic estrogen internally and can help increase bone-density and prolong the process of bone-depreciation. Prevents Cancer – Red clover is not only useful for women, however, and in terms of cancer prevention, it is extremely important for men. Prostate cancer is one of the most dangerous forms of cancer for men, and some of the compounds found in red clover can block certain enzymes that could cause prostate growth. Although some forms of prostate enlargement are benign, a reduction in prostate size is always a good things for long-term male health. How to Prepare Red Clover Syrup? Mix one hand flowers of clover mix with two cups of honey and put the mixture on fire to boil. At the end, add the juice of two freshly squeezed lemons with the peel. When the mix is ready, place it in a bottle. Consume one to two teaspoons, up to three times a day, depending on the severity of the symptoms. For better effect it is recommended to swallow slowly. How to make Red Clover Tea for Colds and Sore throat? Pour four cups of boiling water over a handful of dried red clover flowers. Allow to stand 15 minutes and then add a spoonful of honey. Tea is effective against colds and sore throat.